Employment termination and pay issues can impact people's ability to provide for themselves and their families. 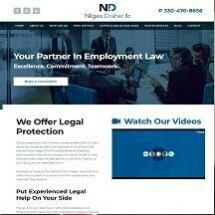 At Nilges Draher LLC, we assist workers throughout Ohio, including Cleveland, Akron, Canton and New Philadelphia, with a range of matters, including those involving wage and hour violations, disability discrimination and job-protected leave. Our attorneys provide personalized guidance and representation to employees throughout Ohio, and we offer free initial consultations. In addition to helping clients in the state with employment law-related problems, our attorneys provide wage and hour counsel to workers nationwide. Our law firm aggressively advocates to see these wrongs and others set right. Our experienced litigators have achieved favorable resolutions on behalf of individual workers and in multijurisdictional class actions, helping to recover millions of dollars in unpaid wages and other damages. Taking a client-focused approach to each case, we tailor our strategies based on each client's specific situations, legal objectives and the statutes implicated. A serious illness, the birth of a child, a sudden injury or an unexpected need to care for a sick family member may force people to take extended time away from work. At Nilges Draher LLC, our law firm team handles cases on behalf of Family and Medical Leave Act eligible workers whose employers have denied them job-protected family or medical leave, or have otherwise retaliated or discriminated against them for exercising their rights.